Visit the Blog Mule Shop. This came across my @scifri twitter feed this morning. When holding magnets to your computer screen at work doesn't satisfy your need to "Turn on, tune in, drop out," the Boston Globe has some other methods of tricking the brain into some alternate universe where everything is groovy - or where you have a long nose. So I don't really see the point in the rubber hand trick. Why would I want to trick my body into feeling pain when I am perfectly capable of hurting myself on the job. But the ping-pong ball one with the radio, now that sounds fun. 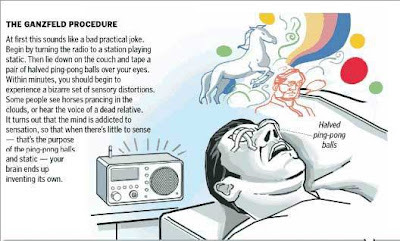 So if you aren't allowed to get high at work, go in the back, tape ping-pong balls to your eyes, put static on the radio and no one, not even your boss, will think you are on drugs. Seriously, they won't. The Boston Globe proved it. Economy got you down? Try selling weed. Or Amway.